$75/ball for 2 Hours or $125/ball for 4 Hours, Minimum of 6 balls (Plus Tax) Feel like being invincible for the day? Slip on the shoulder straps, grab the handles and you will find yourself in a protective bubble of air, now let the games begin! 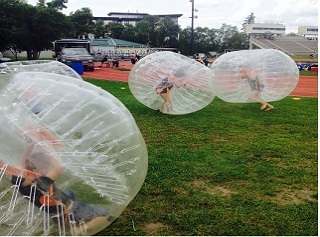 The Astro Balls are guaranteed to be just as entertaining for the spectators as they are for the participants, organize a game or just take a run at a friend and let the hilarious acrobatics ensue! Available in three sizes to accommodate all ages.